If you are like me, this year’s March Madness has led to a lot of busted brackets and little hope of winning any of my bracket pools. But with all the upsets, have come some great teams and stories especially among the Cinderellas. With one of the best stories being Florida Gulf Coast. From the coach and his supermodel wife to the players that barely played before the new regime to the university that was often confused with a Junior college, this team has been media gold and one of the most popular teams. And this historic run (farthest a 15 seed has ever gone) should be a recruiting boost for the institution to be used to attract better players that want to play in a warm climate for a now famous coach. This story will be used in every recruiting trip and be spread by anyone close to the program and for good reason. Players are just like job candidates. They want to be part of something special and want to be shown it. Building off Success: This is just one of the many posts about the university and has been a windfall for the university who’ve seen increased money and admissions since. The team is very likeable and this is something that they will continue to build off of. A few months from now after this story has died down, we’re going to hear a lot less about this team. However, that doesn’t mean the school and program need to stop talking about it. They should be creating campaigns around this and work hard to repeat it next year. Take a look at VCU, the biggest cinderella from 2 years ago. Shaka Smart and the Rams have taken their initial success and transformed the program into one of the NCAA’s most consistent programs. The Insight: The lesson here is to not rest on your laurels but instead continue to market and communicate your accomplishments to attract better talent and drive the business forward. Use past accomplishments to attract quality candidates that will lead to future accomplishments. And track how these messages are being received with recruitment metrics. Culture: One of the most endearing aspects of FGC is their team culture. During and after games and in the locker room, they just seem like a lot of fun. With their chicken dancing, post game celebrations and overall joyful style of play, it is probably their best recruiting tool. The players they are trying to recruit want to be part of a team that is like this. And will continue to be something they talk about to this population. The Insight: If your company culture is unique and fits what the candidates you are trying to attract are looking for, you need to play it up. Use it on your Career Site, in your marketing campaigns, as you talk with candidates and during the interview process. Understanding Needs and Development: When Andy Enfield came to Florida Gulf Coast, he understood that they needed new players and system to be successful. While he knew he wouldn’t be able to recruit his players initially, he decided that he needed players that he could coach up to the level of skill that he was looking for. The Insight: Just as important as recruiting the right players for your organization is understanding upside / growth as well as having the resources internally to train and develop your people. Very few candidates will come in fully ready to contribute at a high level at your organization and you need to be able to turn C and B players into the A players you need to be successful. As you build your organization and recruitment marketing strategy it’s important to keep in mind the candidates you are trying to recruit and the messaging you are using to attract them. Building a winning team can be tough and takes effort and insight in order to accomplish. 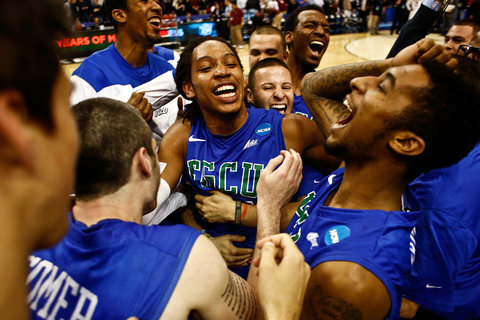 I guess we’ll see next year if Florida Gulf Coast can build upon their recent success.